Who's Healthier: Purebreds or Mixed Breeds? For years, pet owners have disagreed about whether purebred or mixed breed dogs are healthier. Until recently, there was no scientific data to back up their opinions, but UC Davis researchers recently helped answer the question with a landmark health study. Pet owners who thought that mixed breed dogs were healthier argued that inbreeding in purebred dogs increased the likelihood of genetic disorders. Other owners felt that purebred dogs were healthier because many start their lives in professional breeding facilities and are not exposed to infectious diseases that may circulate through animal shelters. Hip Dysplasia Is a Purebred Problem - Or Is It? Hip dysplasia is often used as the prime example of an inherited health problem that primarily affects purebred dogs. The condition, which occurs due to a malformation of the ball and socket joint in the hip, causes pain and weakness in the hind legs and can increase the risk of osteoarthritis. Contrary to popular belief, the UC Davis revealed that hip dysplasia was just as likely to occur in mixed breed dogs as it was in purebreds. Heart Disorders. Mitral valve dysplasia, ventricular septal defect, hypertrophic cardiomyopathy and patent ductus arteriosus occurred at about the same rate in both purebred and mixed breed dogs. Cancer. Cancers, including osteosarcoma, hemangiosarcoma, mast cell tumor and lymphoma, also occurred at about the same rate. Orthopedic Disorders. Patellar luxation (dislocated kneecap) was seen in both purebred and mixed breed dogs. Eye Disorders. Both groups also suffered similar rates of lens luxation, a condition that happens when the clear lens located behind the iris of the eye becomes dislocated. Endocrine Disorders. Both hypoadrenocorticism (Addison's disease) and hyperadrenocorticism (Cushing's disease) occurred at about the same frequency in both groups of dogs. What About Mixed Breed Dogs? Cranial cruciate ligament rupture was the only disorder more likely to occur in mixed breed dogs. The ligament helps keep the knee joints in the hind legs stable. Although purebred dogs do have a higher incidence of some inherited disorders, they are no more likely to develop many serious health conditions, such as cancer, heart disorders and endocrine disorders, than mixed breed dogs. It's crucial to ask questions about health when you consider adding another pet to your family, but it's equally important to consider the animal's temperament, personality, ability to get along with your other pets and the dog's fit with your family. 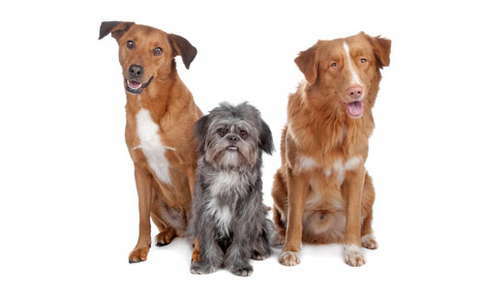 Regular veterinary care is the key to keeping your purebred or mixed breed dog healthy. If it's been a while since your dog has seen a veterinarian or if your pet is experiencing a health problem, call us today to schedule an appointment. Dogs Naturally: Are Mixed Breed Dogs Healthier Than Purebreds?